Commemorative postage stamps for the Polish Corps in Italy were issued during 1946 and 1947. Though considered "Cinderella" or "poster" stamps by some philatelists, these stamps were valid for postage on letters sent from members of the Polish II Corps stationed in Italy. The Polish II Corps, commanded by Lieutenant General Władysław Anders, was created in 1943, as a major tactical and operational force of the Polish Army in the West. During the Italian Campaign of 1944-1945, they became an independent component of the British Eighth Army, and they fought with distinction in the Battles of Monte Cassino (1944), Ancona (1944), and Bologna (1945). By the end of 1945, the Polish II Corps had grown to over 100,000 soldiers. In 1946, the corps was transferred from Italy to the United Kingdom, where it was eventually demobilized. The majority of the soldiers of the Polish II Corps remained in exile and settled in the United Kingdom. One must remember that the Polish II Corps in Italy were the armed forces of the Polish Second Republic Government-in-Exile, located in the United Kingdom. The government-in-exile did not recognize the Communist state that was established by the USSR at the end of World War II, and they continued to exist until the fall of Communism and the establishment of the Polish Third Republic in 1989. The specialized listings for all of the Polish II Corps in Italy stamps, and their many varieties, are in located in the specialized Polish, Italian, and German language catalogs. They are not listed in the Scott Standard Postage Stamp Catalog. Catalog references in this page are from my 2004 Edition of the "Sassone Catalogo Completo dei Francobolli d'Italia e Paesi Italiani" in the chapter entitled "CORPO POLACCO (1946-47)". 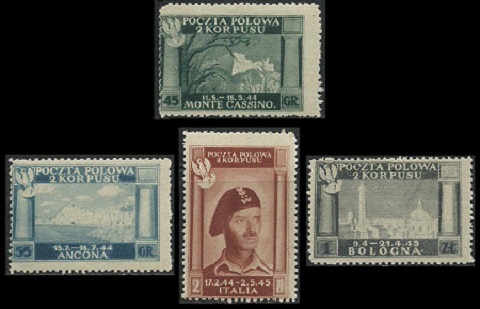 The four major-type Polish Corps in Italy stamps shown above were issued during 1946 to celebrate Polish victories in the Italian Campaign of 1944-1945. These Polish Corps in Italy stamps are denominated in Polish currency, and they were issued without gum. Battle of Monte Cassino (May 1944). Battle of Ancona (September 1944). Battle of Bologna (March 1945). 45 G. (1946 - Sa. #1) - Dark Green. 55 G. (1946 - Sa. #2) - Blue. 01 Z. (1946 - Sa. #3) - Gray. 02 Z. (1946 - Sa. #4) - Brownish Red. 45 G. (1946 - Sa. #1A) - Dark Green. 55 G. (1946 - Sa. #2A) - Blue. 01 Z. (1946 - Sa. #3A) - Gray. 45 G. (1946 - Sa. #5) - Dark Green. 55 G. (1946 - Sa. #6) - Blue. 01 Z. (1946 - Sa. #7) - Slate. 02 Z. (1946 - Sa. #8) - Brownish Red. 45 G. (1946 - Sa. #5B) - Dark Green. 55 G. (1946 - Sa. #6B) - Blue. 01 Z. (1946 - Sa. #7B) - Slate. 02 Z. (1946 - Sa. #8B) - Brownish Red. 45 G. (1946 - Sa. #9) - Gray. 55 G. (1946 - Sa. #10) - Brownish Red. 01 Z. (1946 - Sa. #11) - Green. 02 Z. (1946 - Sa. #12) - Black Brown. 02 Z. (1946 - Sa. #13) - Brown Lilac. 45 G. (1946 - Sa. #14) - Gray. 55 G. (1946 - Sa. #15) - Brownish Red. 02 Z. (1946 - Sa. #16) - Black Brown. 02 Z. (1946 - Sa. #17) - Brown Lilac. 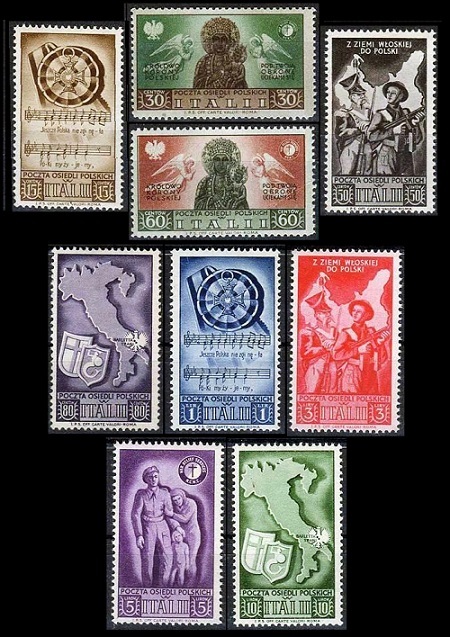 The nine major-type Polish Corps in Italy stamps shown above were issued during 1946. These stamps were sold at the Polish post offices in Trani and Barletta in the Apulia Province of SE Italy, with the proceeds benefiting a War Rescue Fund. These Polish Corps in Italy stamps are denominated in Italian currency. Military decoration and the music of the national anthem. Historical and modern Polish soldiers. Map of Italy and seals of the Polish Corps in Italy. 15 C. (1946 - Sa. #18) - Brown. 30 C. (1946 - Sa. #19) - Green & Brown. 50 C. (1946 - Sa. #20) - Dark Gray. 60 C. (1946 - Sa. #21) - Red Brown & Green Olive. 80 C. (1946 - Sa. #22) - Violet. 01 L. (1946 - Sa. #23) - Blue. 03 L. (1946 - Sa. #24) - Red. 05 L. (1946 - Sa. #25) - Violet. 10 L. (1946 - Sa. #26) - Green. 01 L. (+ 99 L.) (1946 - Sa. #27) - Black. 03 L. (+ 247 L.) (1946 - Sa. #28) - Green. 05 L. (+ 195 L.) (1946 - Sa. #29) - Red. Some of the Polish Corps in Italy stamps shown on this page also exist with production errors, color errors, added airmail overprints, and in souvenir sheets. Please see the specialized catalogs for details.